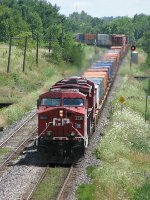 Description: CP AC4400CW 8519 blasts through Wisconsin Dells with a westbound grain train. Description: Entering the north yard at 39th Street. Description: Just off the Fallbridge Sub CP 8519 leads a train into the north yard at 39th Street. Description: Leaving the Fallbridge Sub at 8th Street. Description: Three GEs scoot across the mississippi on the rear of a frieght. Description: Now at Humboldt, ready to pull off the cars and head to Saint Paul. Description: CP 8519 leads a late-day X500 past Michigan Avenue (CP MA) in downtown Lansing. Description: Thanks to a CN train at Trowbridge, I was able to get ahead of X500 after catching him at MA in Lansing. Here we see the train heading east again, just west of Hullett road near Okemos. Description: My tripoded video camera records the train while Justin shoots his video the other way. 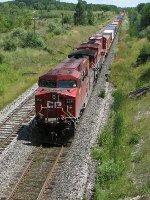 Title: CP 8519 is 2nd on this great powered train. Description: Power at the fuel pad. Description: About 10 minutes before 491 came by, 291 came by with a pair of plane jane AC44s.